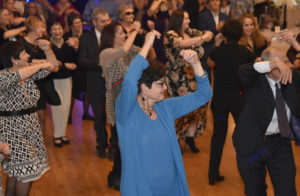 A chavurah is a small Jewish friendship group, consisting of families, couples, or singles who want to share and enjoy their Judaism in fun and informal settings. People join to build relationships with other temple members and their families, often forming bonds of friendship that last decades. Chavurot typically meet once a month, at a time and place established by the group, partaking in all sorts of activities — meals, games, nature outings, sporting events. Every individual chavurah at Temple Sinai is shaped by its members to reflect their particular interests. If you wish to join one and build closer ties to your TSG community, please let us know!